Time to build up the circuit idea from the last post on a breadboard. I decided to use an LM317 and a LM2670. These are both fairly easy to get, inexpensive and available in a TO220 package. There are multiple versions of the LM2670, for this application the –adj version is needed. The schematic is fairly simple and is based on the schematic from the LT3083 datasheet. 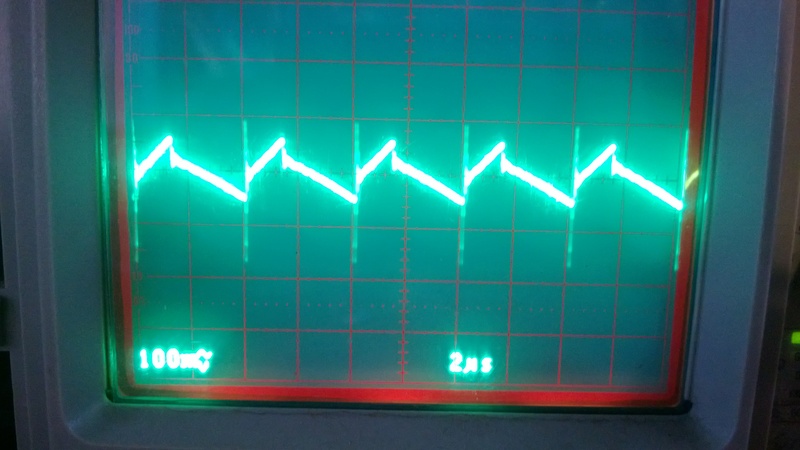 The noise at 3.3V 330mA output are small peaks that are roughly 200mV peak peak. The peaks are very narrow and are in the MHz range. When we look at the frequency it’s about 260Khz, which is the switching frequency of the LM2670, no surprises there. 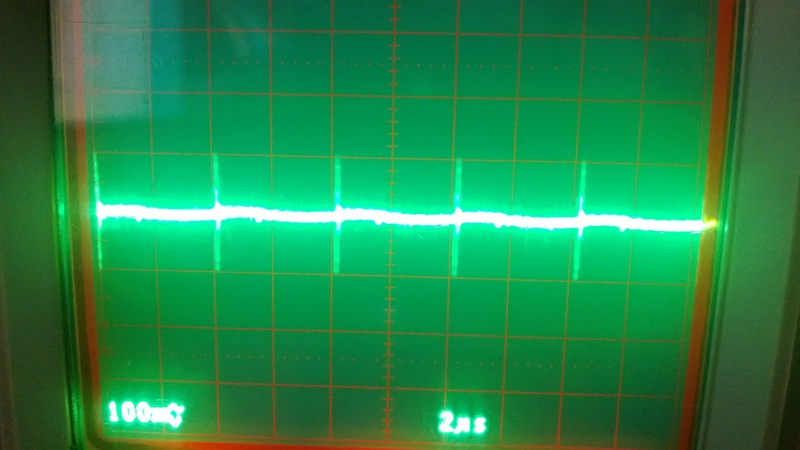 These peaks are caused when the LM2670 switches the internal MOSFET on. Now have a look at the noise from the SMPS. As this is a lower frequency noise then the short peaks they are not visible after the LM317. This is because of the ripple rejection of the LM317. At 120 Hz the ripple rejection is 80db, this means a 1V ripple of 120 Hz will be lowered by 80db, or 10.000 times. 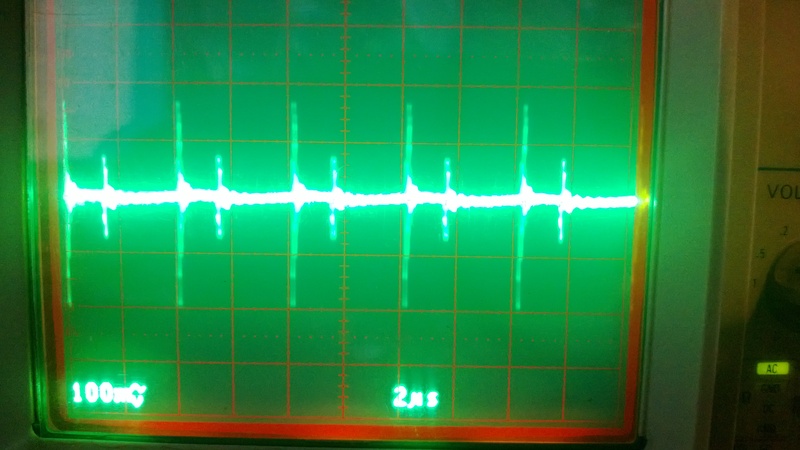 Any ripple of 120 Hz will be almost completely removed by the LM317. But the higher the frequency the lower the ripple rejection. At 250 KHz it is roughly 30db or about 31 times. This would still lower a 100mV ripple to just 3mV, but the LM317 is just not fast enough to do something about the peaks. As I said in the beginning of the blog I used normal capacitors, 100uF electrolytic capacitors. I also added a 1uF film capacitor as they have a low ESR. If I remove the 1uF the noise almost doubled, adding a second peak, a big peak where the LM2670 switched the internal MOSFET on and one where it switched off. With better capacitors the noise should get lower but this already shows the difference a small good 1uF capacitor can make. The fact that it’s build on a breadboard doesn’t help for the noise either, but all in all a successful experiment.